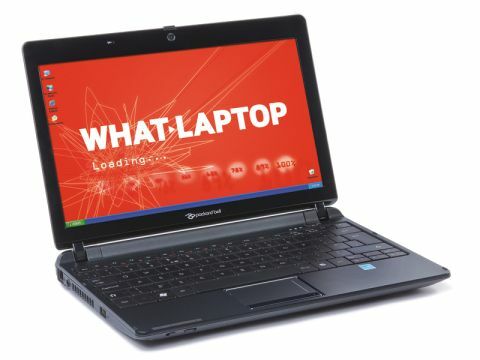 Packard Bell's second 11.6-inch netbook, the dot m, shares exactly the same chassis as the dot m/a, but differs internally by carrying an Intel Atom processor and running Windows XP software. The 11.6-inch screen is very bright, provides great colour reproduction and is especially sharp, thanks to the 1366 x 768-pixel resolution. While still compact, the screen provides enough room to make browsing documents and websites a joy - and photos and movies also look great. The chassis is built from a hard, black matt plastic, which features a mottled design on the palmrest. It is reasonably firm and should provide good protection for the machine's components on the move. The lid is very glossy, however, and apparently designed to replicate a notebook once used by Ernest Hemingway. Either way, its very shiny and quickly collects fingerprints, so you'll have to clean it regularly to keep it looking smart. Despite the relative solidity of the chassis, the keyboard provides a very spongy experience and is the netbook's Achilles heel. The board is large, but the keys are mounted independently and we found they wobbled a lot during typing. The touchpad features multi-touch functionality, but we found it extremely twitchy and preferred to work with it off. An Intel Atom Z520 processor is on board. It has a lower clock speed than the regular N270 and N280, but it is designed to provide a longer battery by being less resource-intensive. The 160GB hard drive will provide plenty of room for all your office files and folders, as well as any photos, music and movies you choose to travel with. Portability is satisfactory, and although we couldn't test the machine's battery life - due to our review unit being a preproduction sample - at 1.3kg the netbook is hardly a burden to carry around. The 802.11g Wi-Fi will provide an adequate wireless connection to the internet when in a hotspot or near a router at home, and the same can be said for the 10/100 Ethernet for wired connections. Three USB ports provide plenty of room for peripherals, such as an external hard drive or optical drive, and a VGA-out lets you connect the machine to an external monitor when at home or in the office. While the keyboard may not reach the standard we expect, all in all, the Packard Bell dot m proves a great netbook. The screen in particular is fantastic and this machine is certainly worth a look.